What’s the Deal with Bedbugs? Is Your Condo Association Infested? What exactly is a bedbug? Bedbugs are insects. They are reddish brown, oval and flat, about the size of an apple seed. Decades ago, bedbugs were eradicated from most developed nations using dichlorodiphenyltrichloroethane (commonly known as DDT) – a pesticide that has since been banned because it’s so toxic. There has been a resurgence of bedbugs in the United States in recent years as a result of increased international travel, changes in pest control practices, and insecticide resistance. And several of our condominium association clients have reported units infested with these little bugs. Despite their small size, bedbugs are a problem. 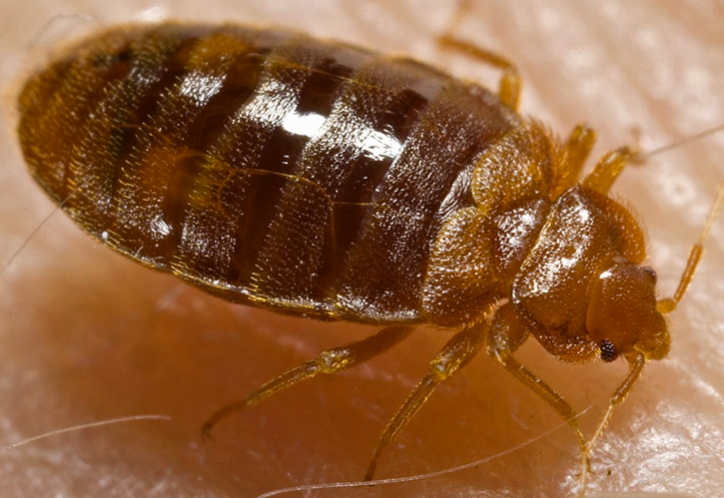 Bedbugs bite the exposed skin of sleeping humans to feed on their blood, and they often take refuge in clothes or luggage left nearby on the floor after feeding on their human hosts. During the day, bedbugs hide in the cracks and crevices of beds, box springs, headboards and bed frames, and they can also can be found under peeling paint and loose wallpaper, under carpeting near baseboards, in upholstered furniture seams, and under light switch plates or electrical outlets. Experts have stated that bedbugs don’t care if their environment is clean or dirty (all they need is a warm host and plenty of hiding places), and that otherwise immaculate homes and hotels can harbor bedbugs. In July of 2010, clothing retailers Hollister and Abercrombie & Fitch had to temporarily close their flagship stores in New York City to eliminate bedbug infestations, likely stemming from bedbugs being on the clothing of visitors to their stores. I was recently contacted by the manager of a condominium building in San Francisco regarding a complaint submitted by an owner stating that she believed she found a bed bug in her unit. The complaining owner lives in a unit below a unit whose owner had recently been found in violation of the Association’s leasing restrictions as a result of leasing the unit for short-term vacation rentals on VRBO and Airbnb (a discussion for another article). As there had been a high frequency of overnight vacationers in the unit above, the complaining owner was concerned that the bedbug came from that unit. This is what I told the manager: (1) if there are bed bugs within a unit, it would generally be an owner’s responsibility to abate the bedbugs; (2) bedbugs can get within walls, so if an owner provides some inspection or eradication report for bedbugs in her unit to the association, the association may need to inspect the inside of the perimeter walls of the unit and other appurtenant common areas for a common area infestation; (3) the association would be responsible to abate bedbugs in the common area, but if the presence of the bedbugs in the common area was the responsibility of an owner (e.g. as a result of used furniture being brought into the unit or clothing worn by the owner’s guests), the association may be able to hold the owner responsible for the cost of abatement of bedbugs in the common area; and (4) if there is a verifiable case of bedbugs in the building, all homeowners should be put on notice of the issue and given links to websites that contain information on dealing with and avoiding bedbug issues, as bedbugs crawl about as fast as a ladybug, being able to easily travel between floors and rooms in condominium buildings. We have had other reports of bedbugs from other associations. In some cases, the associations had to take action, as so many of the units had become infested. In one case, the Association had to fumigate the building to eliminate the bedbug infestation problem. It is very likely that the problem grew as a result of a delay in anyone taking appropriate action. So it is a good idea to not ignore the issue and ensure that owners are dealing with the bugs. When facing a potential bedbug issue, we recommend that an association’s manager and board of directors take quick action and speak with the association’s legal counsel if there are any questions as to the problem being properly addressed.